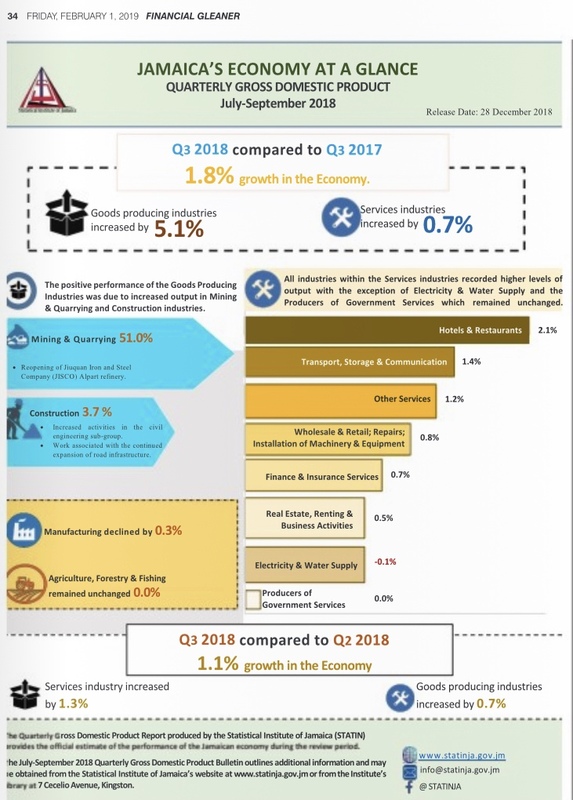 According to the Statistical Institute of Jamaica, here are the highlights for the July – September 2018 quarter for the Jamaican Economy. The positive performance of the Goods Producing Industries was due to increased output in Mining & Quarrying (51.0%) – with the reopening of the Jiuquan Iron and Steel Company (JISCO) Alpart Refinery – and Construction (3.7%) – with increased activities in the civil engineering sub-groups and work associated with the continued expansion of road infrastructure. A decline was noted in Manufacturing (0.3%) while Agriculture, Forestry & Fishing remained unchanged.